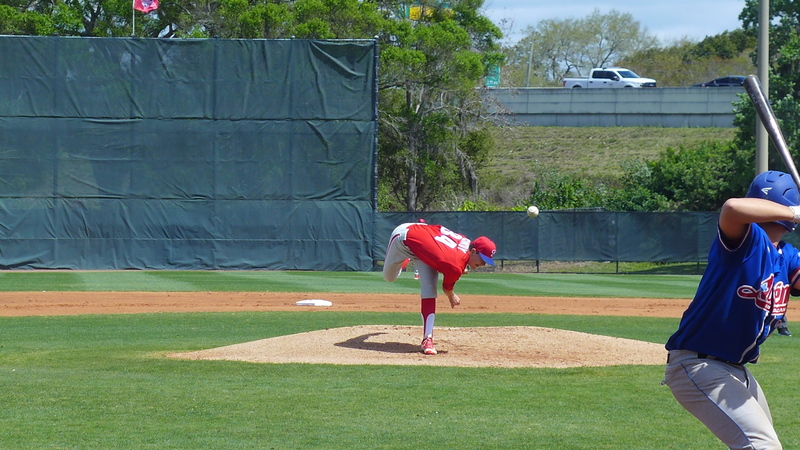 Spring training games started for the minor league groups today. Groups 1 and 2 (AAA and AA) played the Blue Jays at the Complex, Groups 3 and 4 (A+ and A) went on the road. The youngest players hosted a Canadian 18-and-under team traveling through Florida. With the recent reassignments and options, the AAA team is starting to look a little like the IronPigs, but the AA team looks too much like the 2017 Threshers right now. That will change as more players come down from the major league camp. Alec Asher started for the AAA group. He pitched four innings and gave up two runs. Tom Eshelman and Mark Leiter were among the relievers who shut down the Jays the rest of the way. The Phillies were no hit through the early innings. Harold Martinez started a four run rally in the eighth inning. 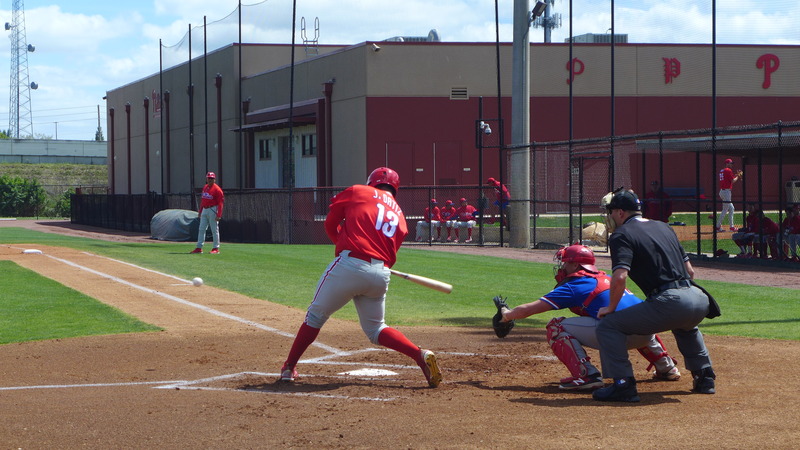 Several camp players batted early and often for both teams – Josh Donaldson, Maikel Franco, and Andres Blanco. 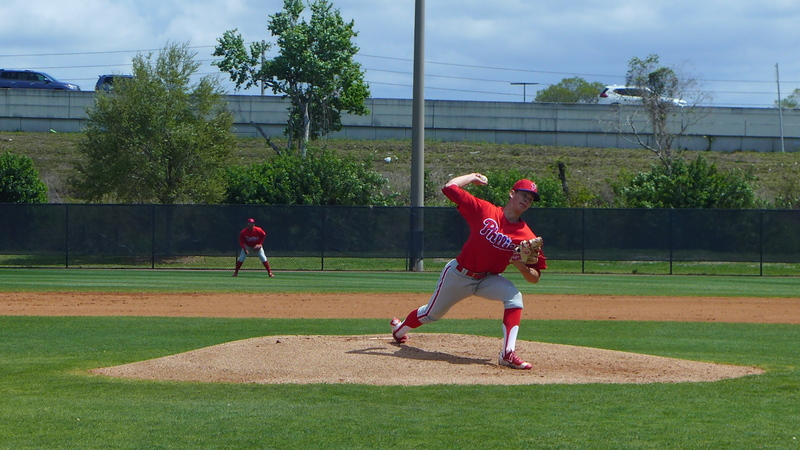 Dylan Cozens, Andrew Pullin, Scot Kingery, Chace Numata, and Rhys Hoskins were in the starting line up. I didn’t pay much attention to the AA game. I’ve spent a lot of time over the past days watching them and they were on Schmidt Field, the least fan friendly field at the Complex (IMO). 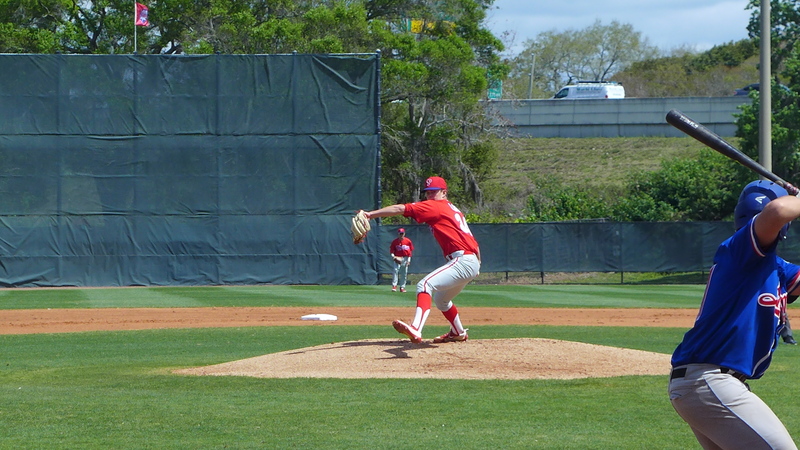 The game on the back field featured Kevin Gowdy and Kyle Young as the first two pitchers. They threw two innings each. Andrew Brown also pitched two innings. Rafael Marchan caught. The infield consisted of Greg Pickett, Jose Antequerra, Jonathan Guzman, and Keudy Bocio. The outfield – Josh Stephen, Simon Muzziotti, and Jhailyn Ortiz. I took some video and a few photos. Josh Stephen video. Josh walked in this at bat and reached on an error by the catcher on a pop fly in a later at bat. He had a rough day on the bases. After the walk, with runners on first and third, he was picked off first by the pitcher. After the error, he reached second base after a Jhailyn Ortiz walk and was picked off by the pitcher again. And a photo of Jhailyn Ortiz. He looks a little bigger to me than last year. Marchan tried to pick a runner off first but threw the ball away. Ortiz got to the ball quickly enough to prevent the runner from taking second. Had the runner tried, Ortiz’ throw was right on the money. More than anything, I get the feeling that he wants to show off his arm. Kevin Gowdy video. And several still photos. Kyle Young video. Young struck out four of the previous five batters. 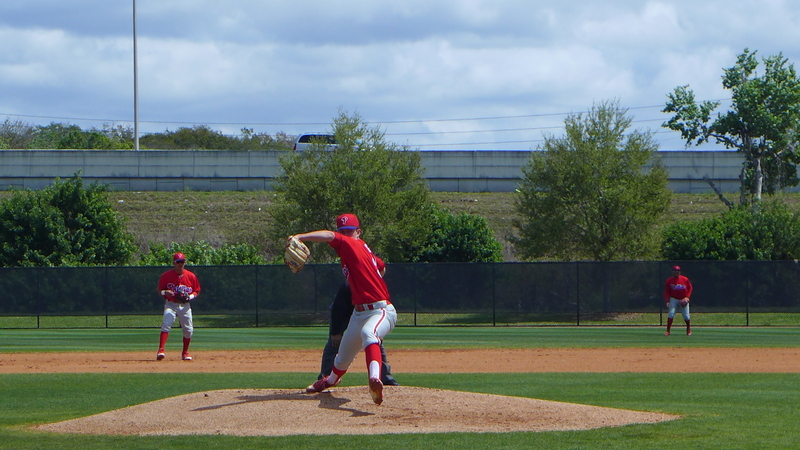 He struck out the side in his first inning, on nine pitches. He didn’t throw a ball until this at bat. I jinxed him. Aaron Brown video, video2. The infielder making the play on the squibber in the first video is Keudy Bocio. And an Andrew Brown photo. Pirates tomorrow. The A groups will be at the Complex. 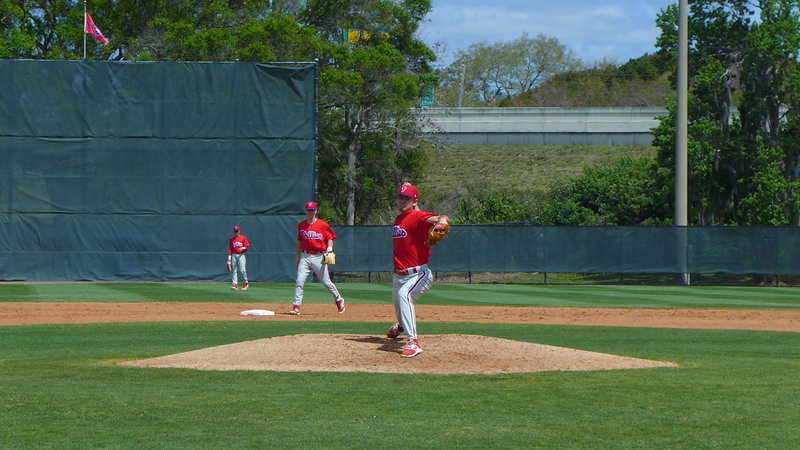 Franklyn Kilome started today, Sixto Sanchez was on the bus. Hope to see Francisco Morales Wednesday. Heard that three minor leaguers were released Tuesday. No idea who yet. Jim, hear anything g about how Kilome and Sanchez pitched yesterday? I’m surprised how filled out Kilome is. He used to be skinny but he’s strong and filled out now. That’s our future! Great stuff Jim, as always. Truly wish I could get away from HS coaching responsibilities for 48 hours and fly down there. On a side note, I just read Gelb’s 2.0 roster prediction. I could not believe my eyes when I noticed he had Luis Garcia on the 25-man over a second lefty. In this case it would be Adam Morgan. Morgan could also be a swing man starter in a pinch, let alone we have all seen that Luis Garcia is a mediocre AAA arm at best. Yes the velo is intriguing, but the track record in scrap heap worthy. “He’s picked up a splitter, yada yada yada.” Give me a break. Drain the swamp of that dude! Don’t you think Venditte is more likely than Morgan? IMO you can DFA Garcia and Morgan. 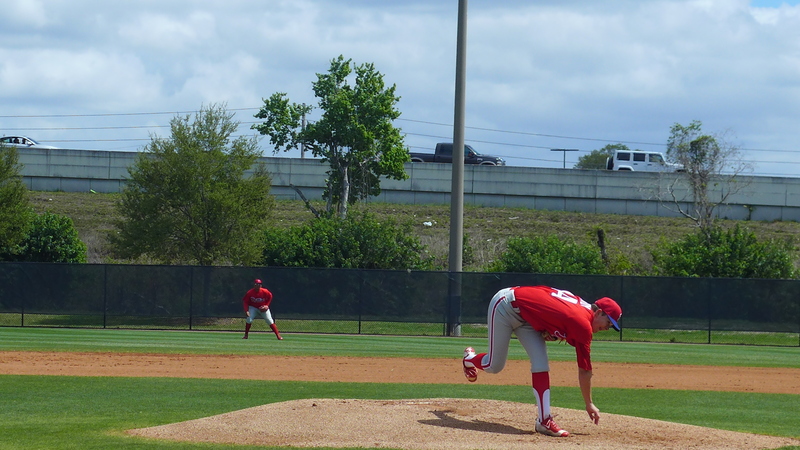 Word is Luis Garcia, according to one of the beat guys–maybe Matt Gelb himself, and by Hector Neris’ insistence is now throwing the splitter and the Phillies are optimistic. So there in may lie the reason Matt Gelb has him on the 25 projection right now. Can’t hurt to Give Garcia one more try and if it turns out to be same old Luis, let him go and call up someone not on the 40 man to take his spot.